Heart Attack, also called Myocardial Infarction, is a life threatening clinical condition when blood flow to the heart stops. Blockage happens due to fat, cholesterol or other substances. Mostly heart attacks are caused by coronary heart diseases. 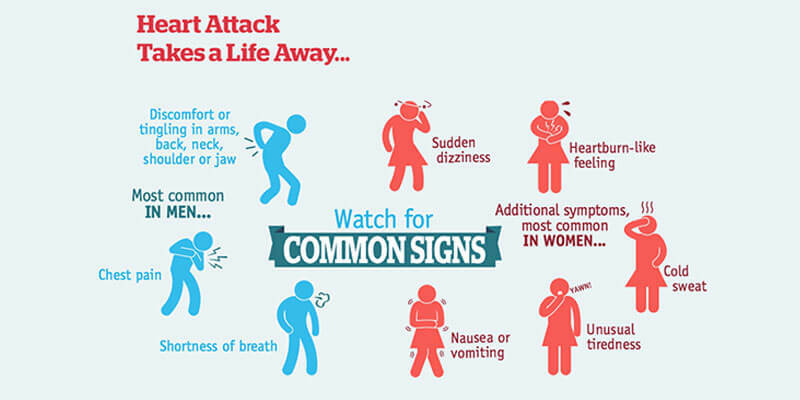 There are various symptoms of heart attack and may vary from one person or gender to another person or gender. Following are the most common symptoms. Patient can experience one of these symptoms or a combination. If you notice any of these symptoms in yourself or anyone else around you, call 1122 immediately for ambulance help.